Row 2-4: skip first sc, sc in each sc across, ch 1, turn. In the dark? Need help with this project? Jot your question below and I’ll get back with you! 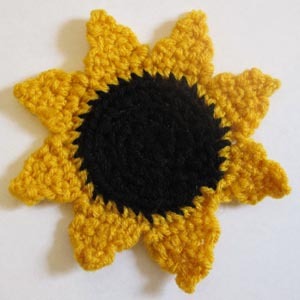 This entry was posted on Wednesday, August 15th, 2012 at 8:09 AM by Emilee Gettle	and is filed under Free Crochet Patterns. You can follow any responses to this entry through the RSS 2.0 feed. You can skip to the end and leave a response. Pinging is currently not allowed. This is so cute. You could make this in other colors for coasters too. sc in next 4 sc on center. what center? where? Ok now I see what you mean about the center. Thank you for this beautiful pattern!